(b) Candidates those who do not possess the qualifications stated in section 4.2. (a) above, can apply for registration if they have obtained any one of the following qualifications, accepted by the University of Kelaniya. 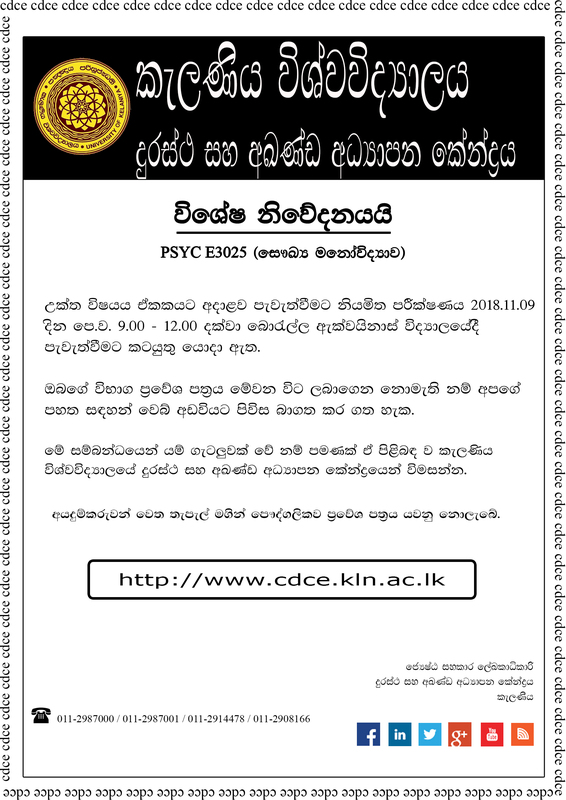 The Vocational (Special) Teachers' Certificate of the Sri Lanka Department of Education. Passed First and Second Examinations of the Course leading to the Diploma in Commerce of the Sri Lanka Technical College. Passed First and Second Examinations of the Course leading to the Diploma in Accountancy of the Sri Lanka Technical College. Passed 1st, 2nd and 3rd Examinations conducted by CIMA (London) or the Association of Certified and Corporate Accountants. Passed the Intermediate Examination of the Institute of Chartered Accountants of Sri Lanka. Associate Membership of the Institute of Chartered Secretaries, London. Passed the Final Examination of the Sri Lanka Bankers' Institute. Associate membership of the London Institute of Bankers. A Diploma in Business Studies awarded by a former Junior University or a recognised Polytechnical Institute. Completed one-year service as a commissioned officer of a permanent unit of the Sri Lanka Army, Navy or Air Force. An officer in the Sri Lanka Administrative Service who has passed in the examination for recruitment to Class III of the Sri Lanka Administrative Service. 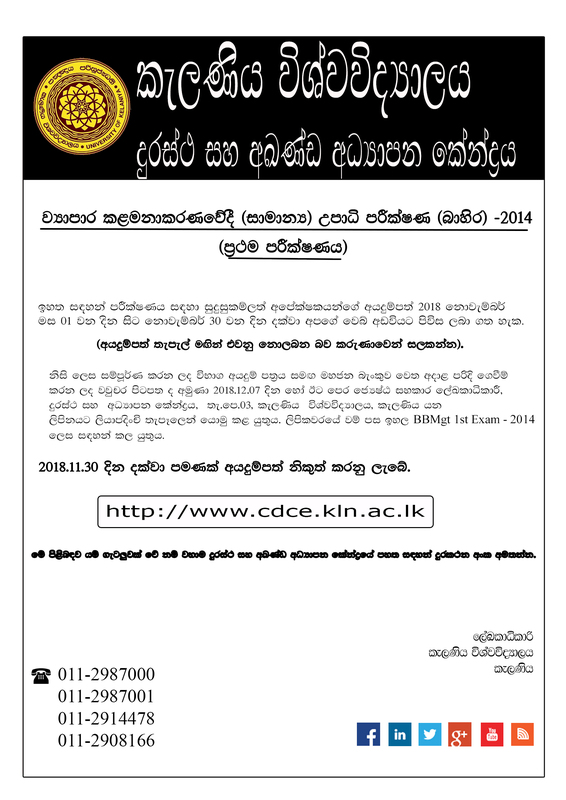 Certificate in Business Studies of the Sri Lanka Technical College. Membership of the Association of Company and Commercial Accountants of the United Kingdom. Diploma of the Institute of Work Study Practitioners, England. Associate Membership of the Institute of Management of Britain. Passed all sections of the examination of the Institute of Administrative Accounting, London. Passed the Book-keepers' Advanced Certificate in Commerce of the Sri Lanka Technical College or of the Polytechnical Institute of the Ministry of Education. Joined the government Accountants' Service on passing the Sri Lanka Government Accountants' Final Examination. An officer of the Management Service of the Ministry of Public Administration, on having passed the examinations conducted by the Commissioner of Examinations for recruitment to that service. Passed the Book-keepers' Higher Certificate of the London Chamber of Commerce. Passed the Advanced National Diploma in Management of the Open University of Sri Lanka. Membership of the Accountants' Technical Institute in Sri Lanka. Work experience at executive level of Management in Government or private sector. In addition to that, opportunities are given to candidates those who are having any other qualifications acceptable to the faculty of Commerce and Management and the Senate of this University. The Senate decision is the final in this regard. To complete the B.B.Mgt. (General) degree, a minimum of three years must elapse from registration. A candidate is qualified to sit the First Examination in Business Management on completion of one academic year after registration. Only those who pass or are referred at the said examination are eligible to complete their degree by sitting the first and second parts of the Bachelor of Business Management (General) degree examinations respectively, in the two subsequent years.